One of the things on my summer bucket list was to find a new game for Caleb and me to play. We like to play games in the evenings, but I think it's hard to find fun games for just two people. In the winter we played an insane amount of Monopoly Deal (Caleb is winning with 47 wins to my 46). We also play a lot of Scrabble. My very thoughtful mom remembered that I wanted a new game, so she got me one for my birthday! She actually bought two games; I picked one and she kept the other. I recommend both of the games. 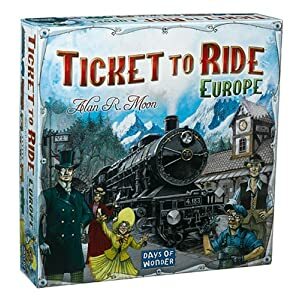 I had played Ticket to Ride twice before but had kind of forgotten about it. It's a strategy game where you collect and play matching train cards to claim railway routes across Europe, scoring points for long routes. There's a bunch of other twists and rules that make the game really fun. This game kind of reminds of me of Settlers of Catan, but it's way better because I don't actually like Settlers. This is the game I ended up picking. We're still figuring out our different strategies but we're really enjoying it. Qwirkle was the other game my mom bought, and we ended up playing it several times when we visited. It looks really weird, but it's really fun. You use blocks to score points by building lines that share a common attribute - either the color the shape. It is fairly simple to play, but if you want to score a lot of points and win, you really have to strategize. Qwirkle also just won the 2011 Spiel des Jahres award, which is the most prestigious game award. Caleb was really good at this game (I think it's the engineer in him), so I'm sure we'll be adding this game to our collection at some point as well. Are you a game person? What games do you and your family like to play? I am a total board gamer!! So much fun especially when you get a few couples together! I have never heard of Qwirkle..sounds like a blast though! that is adorable that you guys like to play games together. my favorite is always monopoly, year after year. those new ones look good! Oh and I love scattergories...because I am the word genius! I always win! oh i've heard of ticket to ride! i really want to try it out! I've never heard of this. I used to be such a game person, but now (in my free time) I blog lol. We are always searching for a new game for two. Will have to check these both out! Thanks for posting! Ooh fun! love board games! I love taboo! we love playing catch phrase, the game of things and battle of the sexes... I also played cranium with a large group once and it was hilarious! Awww, I love that you guys play games together! We don't play many games, but thats a great idea. We do go hit golf balls a lot, as well as go on runs and walks together in evenings. We like to be outside, I guess! We love ticket to ride! We've probably played it 3o times this summer. At least. Have fun! I love playing monopoly. It's super hard to find anyone who will play it with me though! oh i am definitely a gamer! love it--one of the fav--boggle:) and i adore that pretty present!!! I'm not big on board games, but the train one does look fun. My husband and I love Apples to Apples, but it takes at least four people to play properly :( Thanks for sharing! I'm am sad to say that I am not a game person, I don't know if its because I never win, or I just cant keep focus for long periods of time. Although my family LOVES games I'll have to introduce them to some of these! I love Qwirkle and Ticket to Ride (my favorite is their version for 2-3). We play both all the time, even got Felix's family hooked on Qwirkle! Glad you are enjoying them together ... it's wonderful having a husband who enjoys games! I love that about Felix! I am a HUGE gamer. My friends and I love love love Settlers of Catan and Banangrams!